Levitt Safety, the largest Canadian specialist in safety and fire-protection products, has spent the last four years working with Justin Roff-Marsh to adopt a Sales Process Engineering model. It has reduced the number of field salespeople and has shifted their work to inside sales and customer service. While Levitt made these dramatic changes, it saw no initial decrease in sales, it gained more control over its growth, and it achieved significant improvements in customer satisfaction. Justin Roff-Marsh interviewed Bruce Levitt and Fraser Gibson at Levitt Safety about their adoption of SPE and published the interview on his site. 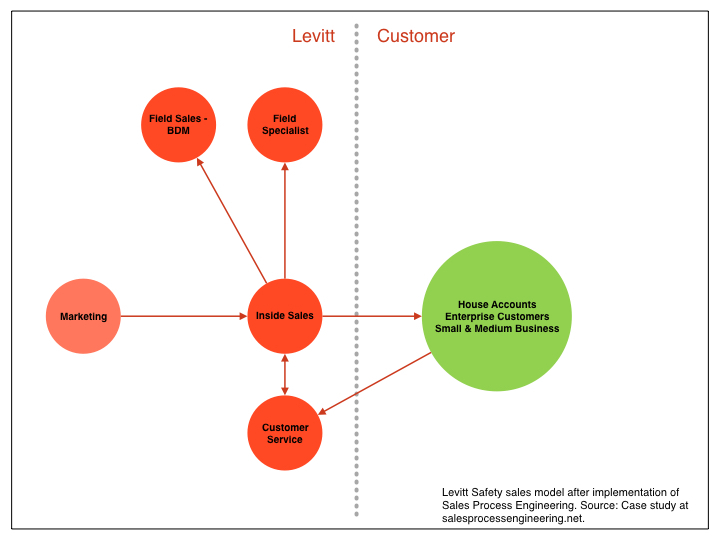 In this article we’ll look at Levitt’s sales model before and after their implementation of Sales Process Engineering. Let’s start by examining the sales model they were using four years ago. If I were to wind the clock back, I’d say we’ve been in the inside sales business for probably ten years. Our inside sales group in Ontario operated with a traditional format that many companies in our industry have adopted. That is to say, they have their clients and they do business their way. In addition, you have the classic tiering of accounts, where you have house accounts that dealt with customer service, you have small and mid-sized accounts that dealt with inside sales and finally you have field sales who are supposed to be dealing with the the biggest opportunities. The only structure for the field salespeople was “Here’s a list of the accounts you call on. What you choose to do is your own business. It would be kind of nice if at the end of the year you reached sales that approached your quota.” And the inside group operated in much the same way, they just had a bigger list of accounts. We weren’t tracking or enforcing anything in terms of who you need to be speaking with, here’s what you need to be talking about, here’s the number of calls that you need to be making a day. Although marketing produced campaigns, salespeople felt no obligation execute those campaigns and marketing never knew if they were giving salespeople what they needed to be successful. 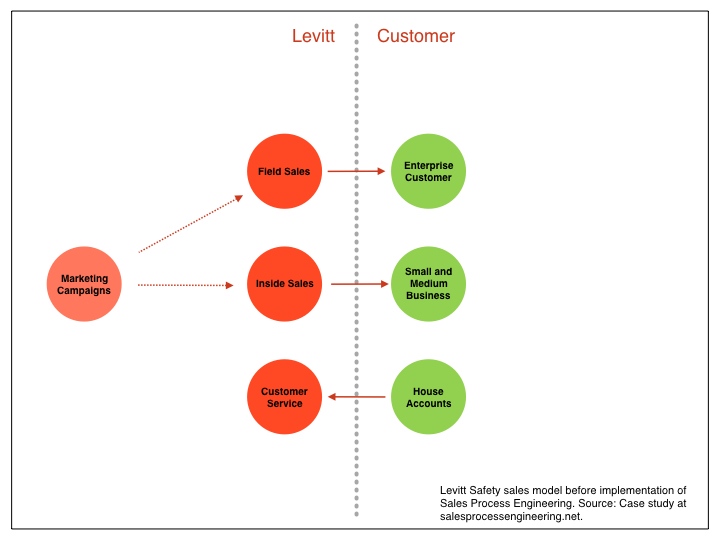 If you are looking at Levitt’s old sales model through the SPE lens, it’s not hard to make a list of problems with their model. Lack of sales opportunities. Marketing produced some campaigns,but there was no measurement to verify whether they were useful campaigns for sales. Sales was free to use the campaigns (or not). Salespeople were responsible for their own prospecting in their territories. The company had no way to know the quality of the prospects they discovered nor how much of salesperson’s time this required. Not enough time selling. Salespeople were responsible for prospecting, selling, customer service and account administration. These responsibilities did not allow them to do what they are best at, engaging customers in meaningful selling interactions. Stove-piped account assignments. Since field sales, inside sales, and customer service each worked on their own accounts, there was no possibility to use each other’s resources more efficiently. Some small companies had opportunities that warranted a relationship with a field sales rep who could go to the customer site, but that never happened since inside sales owned the small business accounts. Conversely, many transactions at the enterprise accounts could have been conducted more quickly and efficiently by inside sales or customer service, but field sales owned those accounts and so they were responsible for all transactions, from the complex to the routine. Now that we’ve looked at the way Levitt conducted business four years ago, let’s examine the changes they’ve made and the impact of those changes on their business. Inside sales initiates all outbound communication with all customers. This includes enterprise, small/medium business, and house accounts. Sales does not do its own prospecting. Campaigns for both new and existing customers originate in the marketing promotions team. Marketing releases a campaign to inside sales and they execute it. By working together they enable inside salespeople to have 30 meaningful sales conversations per day. All customer service questions and issues, regardless of account type, are fed to customer service. Customer service has gone from taking many days to complete a customer service issue to completing them in one day. People in the field include both field specialists (product and technical specialists) and business development managers (sales) who reach out to customers at the request of inside sales. Although the interview does not go into the details of their financial result from this transition, Levitt and Gibson reveal the general financial trends in their interview. Sales is growing steadily as they continue to reduce the number of people in the field. Customer satisfaction has increased. And the management at Levitt has a much better sense of control over the direction and the pace of their business growth.